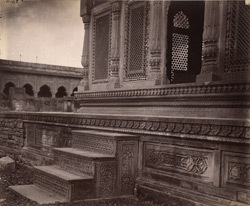 Photograph of the base of the platform and the steps of a cenotaph of the Scindia family at Lashkar near Gwalior, taken by Bourne and Shepherd around 1883. Lashkar is situated about two miles from Gwalior and was founded in 1810 by Daulat Rao Sindhia who set up his lashkar (camp) there, thus giving the town its name. H.H. Cole states in his 'Preservation of National Monuments in India' that "The Chattris of the Scindias in the modern town are of solid construction and beautiful design. The example illustrated unites an unusual simplicity of outline with great elaboration of detail. Excepting some of the buildings at Udaipur in Rajputana, this is one of the most successful modern princely buildings I know in India. Unfortunately it is thought necessary to periodically whitewash the walls, and the sharp outline of the sculptures is disappearing."